There was a downpour at the beginning, and a downpour at the end. Lightning and thunder. It was as if the rain had been cast especially for the women's marathon start and finish on the Mall. Could rotten British weather be called on to give some sort of advantage to the northern European sisterhood? Considering the stately background - the Queen's central London residence behind, the Victoria Memorial in the middle of the last bend - it felt a bit understated, a bit damp, a bit of a struggle against the odds, not just for competitors. But the Marathon was one of the events across the capital taking the Games out to the city. Like Super Saturday's Hyde Park women's triathlon; Bradley Wiggins's glorious gold in the cycling time trial at Hampton Court; the men's and women's cycle road races; the men's triathlon coming up this Tuesday and the men's marathon next Sunday. They are the more democratic of events. People do not need a ticket to go, although the best seats alongside the finish have been put on sale. The free events staged within the capital have drawn crowds in the hundreds of thousands after the furore over demand for tickets to the London 2012 Games. Saturday's contest saw them 10-deep in Hyde Park. 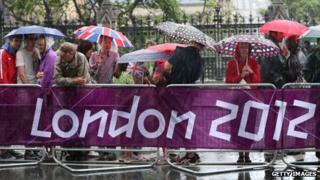 The rain on Sunday meant mostly those whose Olympic fever was in full sweat went out on to the streets. Many were bleary after a Saturday night spent celebrating three gold medals for Britain. "The Olympic Park was just the best night, Jess, Farah and the long jump. We watched on a big screen," said Caroline Owens, who admitted to "breaking into" her wedding budget to keep coming back to the Games. People had foregone a Sunday lie-in, caught buses down from Nottingham, driven up the M4 from Wales, shacked up with friends or camped out in parks in Essex for a week to catch this, and in some cases, every, free Olympic spectator event. Two families stood outside Buckingham Palace having made the journey from near Bridgend, South Wales. The Jenkins were misty eyed having seen Helen Jenkins (no relation) miss a medal and finish fifth on Saturday. Their friends, the Simpsons, drove from Wales at 0430 to be part of the Olympic atmosphere. "I was quite worried I was going to get DVT if I watched any more of it on the telly," laughs Cheryl Simpson. "I've come to have a walk around at the marathon." In effect, they were standing through heavy showers to watch a small bunch of slight women flash past four times. There was no mass race of people dressed as rhinos and the only light relief came from laughing at the newspaper snappers on the back of the open photographers' vehicle. They looked really wet. They were also here because of the Games tagline, "Inspire a generation". Babies, children "teenangels" had all been brought along. Linda Cooke, from Coventry, boarded the 0610 bus to London with children Joseph, 10, and Hannah, 13. "It's an opportunity not to be missed," she said. "A chance to support our country, something they will remember. "I'll probably have forgotten by next week, Mum," said Hannah. Oh well. Image caption Linda Cooke: Short memory? The sun came out, briefly and the chat amongst the crowd was that British athletes were doing an "amazing" job at the Games, but it was a disappointment to see Mark Cavendish beaten in the road race, Paula pull out of the marathon, Yamauchi pull up here. They were not being dramatic, no-one was "gutted". Downturns were tempered by Olympic spirit. There was still real anger that people were unable to get tickets to events at the Games but people standing together to watch the race were also proud at the job the country was doing in staging the Olympics. At the high point of the weather someone was even eating an ice cream. Siobhan Gay is just the sort of person British Olympic Association Colin Moynihan would have grabbed on Sunday morning when he said funding for school sport should be boosted to increase participation. She had foregone her marathon training to be there, after interest was sparked by a teacher at school who happened to encourage pupils into running. Nothing planned, nothing on the curriculum. "I should be doing my long run today," she said. "I've got my first full marathon in October, I'm looking forward to it, but still absolutely terrified." At the final lap the rain closed back in and Ethiopian Tiki Gelana crossed the line first. A small clutch of Ethiopian fans were jumping up and down in the wet. The British supporters cheered but saved their biggest applause for Freya Murray, who came in 44th and Claire Hallissey, in 57th. Many will be back for their Olympic freebie on Tuesday, the men's triathlon in Hyde Park, come rain or shine.